9:10 - Historian James Livingston explains why work isn't working for anyone but the rich. 10:00 - Activist Azzurra Crispino updates us on repression and resistance during the US prison labor strike. 10:35 - Naked Capitalism's Yves Smith calls in from the wrong side of the fake news scare. This week Yves wrote the blog post We Demand That The Washington Post Retract Its Propaganda Story Defaming Naked Capitalism and Other Sites and Issue an Apology. 11:00 - Journalist Sarah Jaffe looks to the radicalizing possibilities of protest in the Trump era. Sarah wrote the article Why Anti-Trump Protests Matter for Rolling Stone. 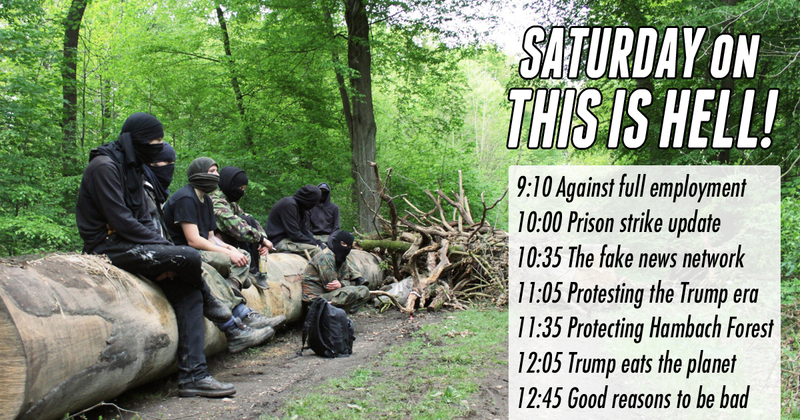 11:35 - Live from Germany, Manuel Carrasco Molina reports on anti-coal actions deep in the Hambach Forest. 12:05 - Author Ashley Dawson previews the Trump administration's environmental horror show. Ashley recently wrote Trump Eats the Planet for the Verso blog. 12:45 - In a Moment of Truth, Jeff Dorchen drops a few more good reasons to be a bad citizen. Jeff Dorchen, classic bad boy.